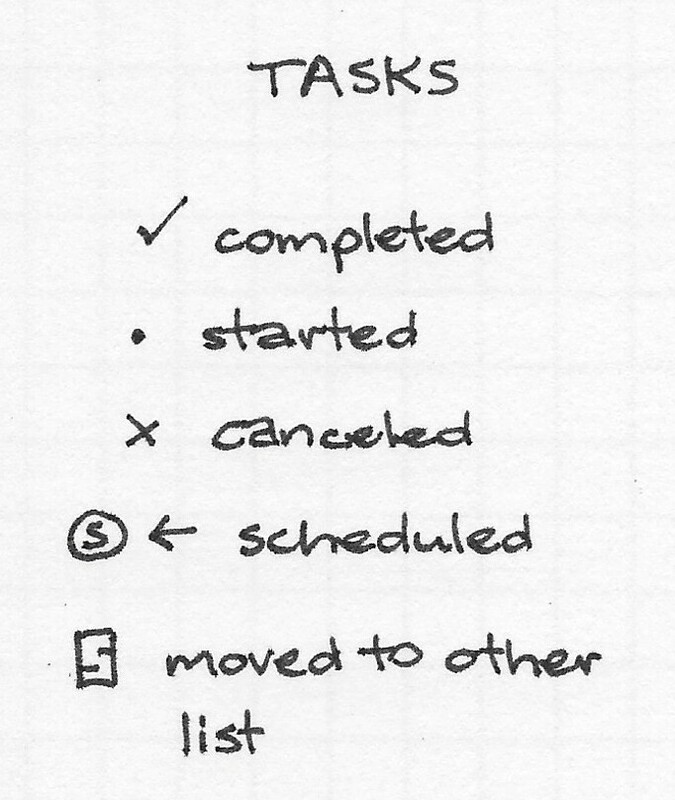 Use these task list indicators to monitor your progress when completing tasks. 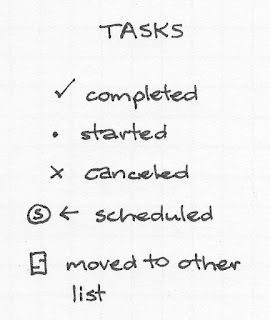 Tasks that have been acted upon are still visible, permitting you to track the evolution of a task from initially added to a list to eventually deleted, delegated, or canceled. 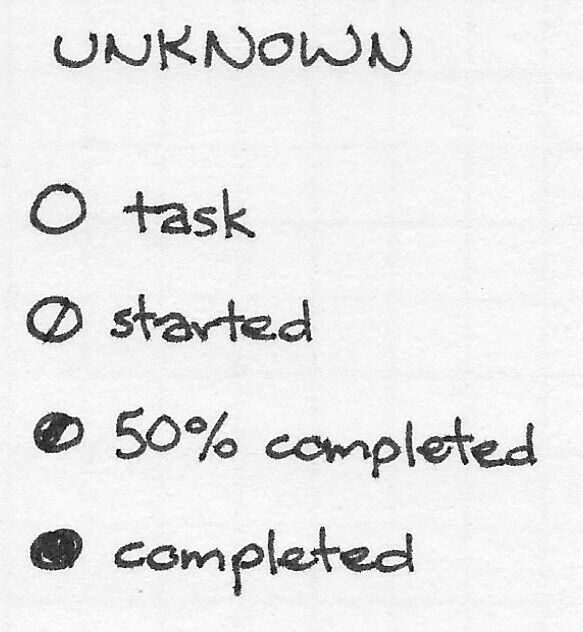 By adding status indicators to tasks, you can track the progress of each task. 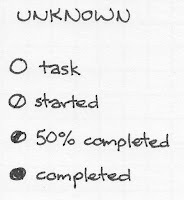 You can view a completed list of tasks and feel satisfied at a job well done. 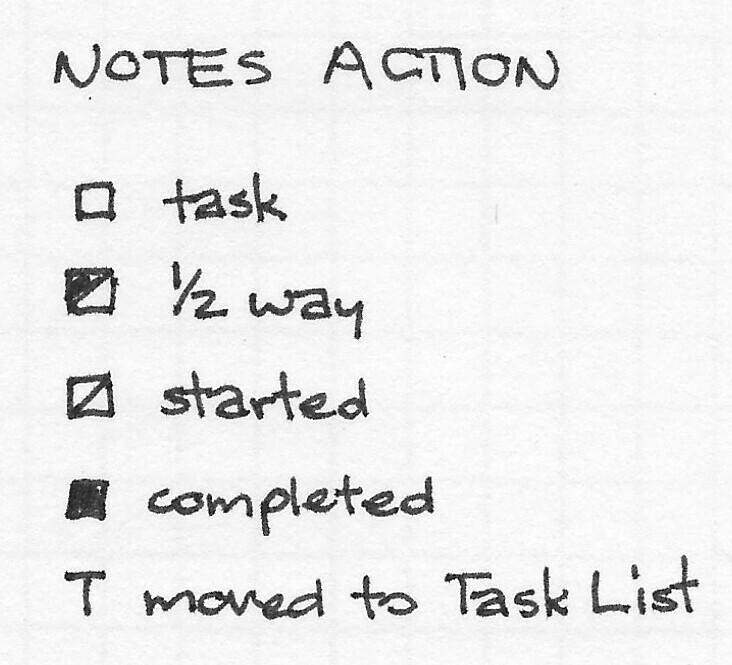 Additionally, you can use task lists to review categories of tasks in order to monitor and improve performance. 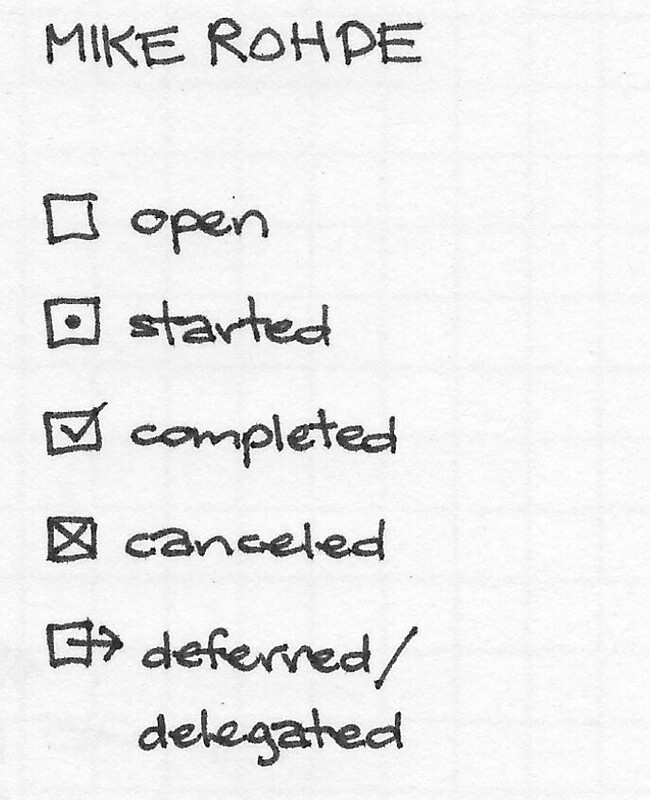 Below are six variations of task list status indicators. The first four sets are ones that I have come across in my Internet journeys. The last two sets are the ones that I use every day. 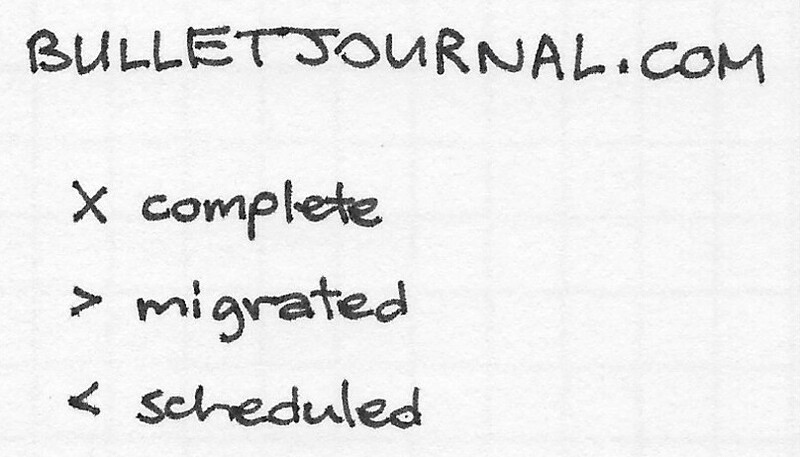 From the BulletJournal website: "The Bullet Journal is a customizable and forgiving organization system. It can be your to-do list, sketchbook, notebook, and diary, but most likely, it will be all of the above. It will teach you to do more with less." 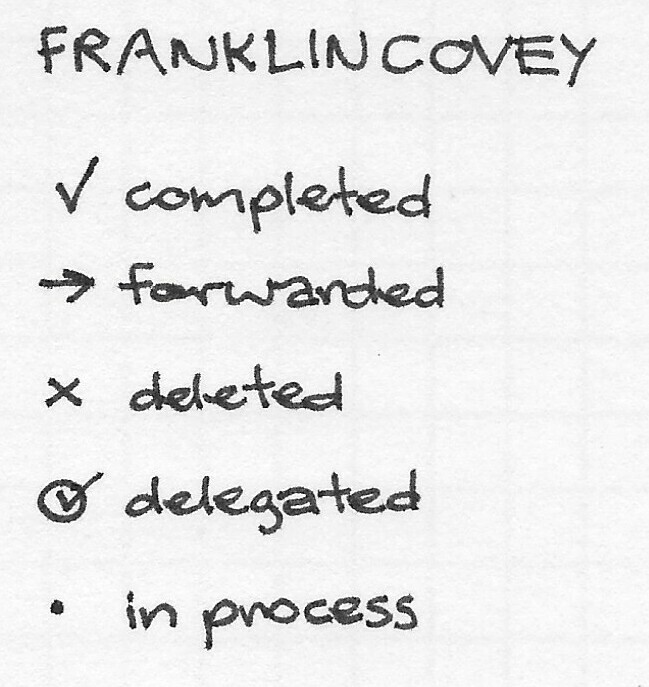 FranklinCovey is a productivity company focused on performance improvement. According to the company's website, "We help organizations achieve results that require a change in human behavior." Co-founded by Stephen Covey, much of the content is based on Covey's book, The 7 Habits of Highly Effective People." In the Sketchnote Workbook, Mike Rohde walks readers through specific ways to enhance visual notes and organization. I recently came across this set of indicators, but was unable to relocate the source for this post. However, I wanted to include it because it is slightly different than those included thus far. The small circles remind me of the achievement tests I had to take in school and of the satisfaction of filling in each circle completely with my #2 pencil. 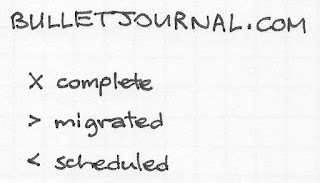 As I have previously written in a post on my DIY planner, I dedicate one section of my weekly planning pages to tasks. My set of indicators is modified from the FranklinCovey indicator list. In a separate section of my weekly planning pages, I also have space for notes from meetings, observations, and other interesting tidbits. 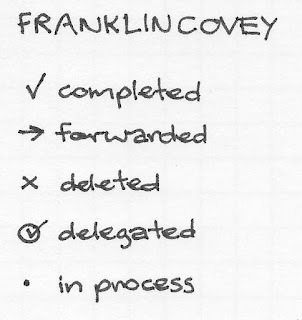 When taking notes from various meetings, I usually use some sort of bullets to record each agenda item. If an action item is assigned to me - or I assign it to myself - I use the status icons below to ensure that it stands out from the routine agenda items. I also use this set of icons when making notes on handouts or other documents. 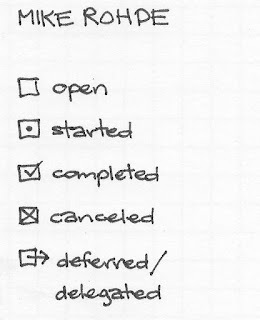 In these situations, I usually create a task list on the first page of the document. You have probably noticed that this set of indicators is similar to Unknown set displayed above. Since I've been using this set for several years, it is always interesting to find similar approaches to tasks from across the world. 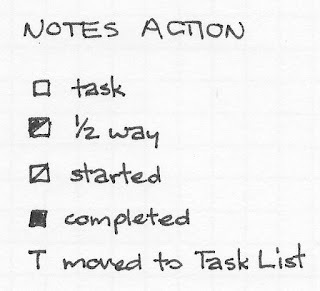 If you are already using a system to track your tasks, please comment below and let me know what your system is and how well it is working. If you need a system to help improve your approach to tasks, I encourage you to try one or all of these sets to see which one works best for you. Let me know how it goes by commenting below.